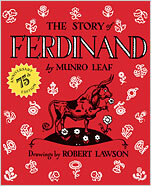 Ferdinand (1936) by Munro Leaf is one of the most influential children’s books because of its simple but powerful theme. The tale of a bull who likes to smell flowers instead of fighting was seen as a pacifist text at the time of the Spanish Civil War. 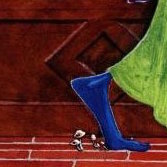 Ferdinand is a reflective character who chooses to be himself rather than follow an aggressive crowd-mentality. 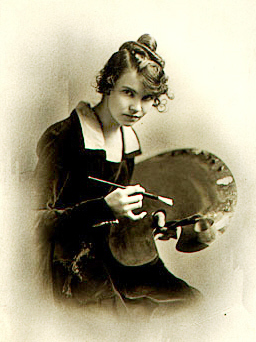 Munro Leaf also wrote books which reflected the stricter child-raising style of his time. 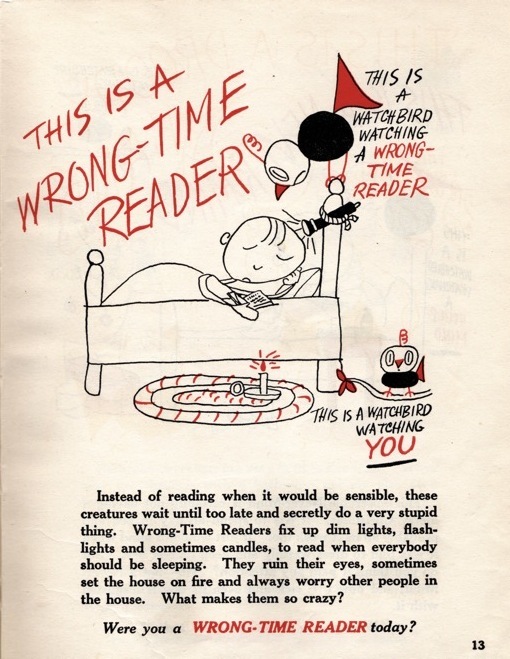 3 and 30 Watchbirds (1941) condemns children’s behaviours such as shoe-scuffing, primping, mumbling, moaning, fidgeting, sassing and wasting food. Some of it’s in the spirit of war-time frugality, but some is just plain excessive! Grammar Can Be Fun is slightly more tongue-in-cheek and warns children against slack language such as “gimme, wanna, gonna, and ain’t”. Not another pirate picture book! Yes, but a beautifully offbeat one. 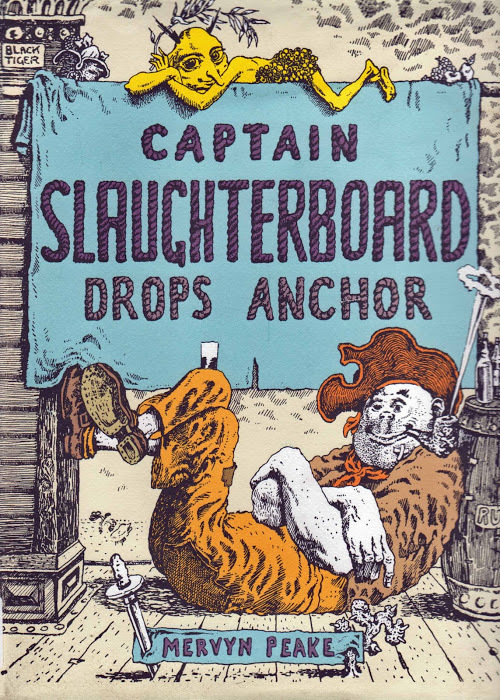 Captain Slaughterboard Drops Anchor (1939) is a masterpiece of illustration by the artist/novelist Mervyn Peake (author of the intricate Gormenghast trilogy). His pirate Captain has a mid-life crisis on a weird pink island where he discovers ‘a creature as bright as butter’ who inspires him to ‘drop out’ (the creature looks ‘like Bob Dylan with cocker-spaniel ears’ – NY Times.) Peake’s son, Fabian, says his father always wanted to live on an island ‘living a bohemian life free from the pressures of modern society’. See more of Peake’s incredible illustrations. 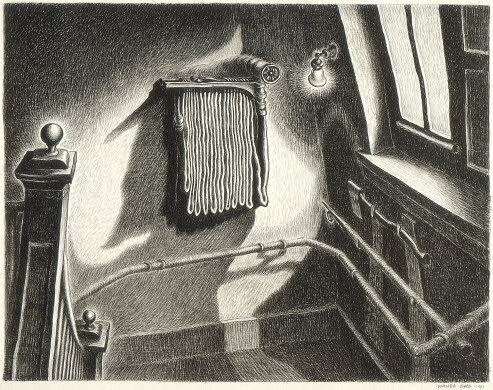 Picture books by Chris van Allsburg are not only beautifully illustrated, the stories are open to wide interpretation, which makes them ideal for children. 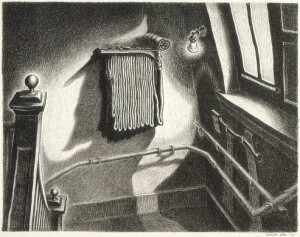 It’s impossible to look at the pictures in Harris Burdick without imagining a story. 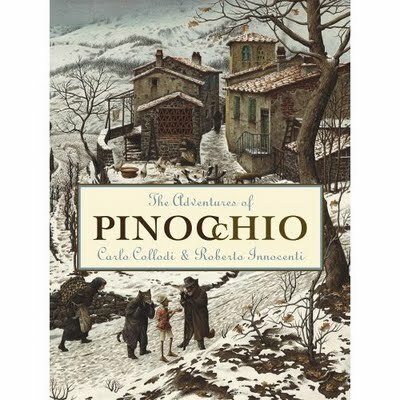 (There’s also a spinoff, Chronicles of Harris Burdick, short stories by writers including Stephen King and Lemony Snickett). 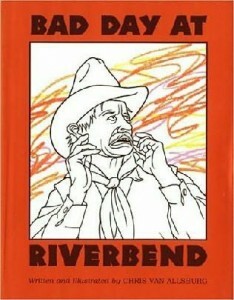 My other surreal favourites are Bad Day at Riverbend, about a black and white cowboy town attacked by a crayon – and The Wretched Stone, about a strange glowing stone which makes the people regress intellectually. William Steig, (creator of Shrek) has been called ‘one of the finest cartoonists and creators of children’s books’ (Jonathan Cott). He began writing for children at 60 and his stories are often uncompromising but always celebrate the richness of relationships and nature. Steig used sophisticated language to entertain readers rather than befuddle them. 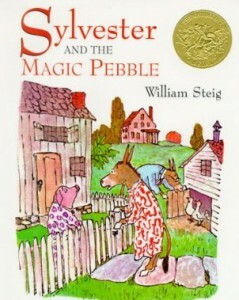 Read the full article about William Steig and his books. 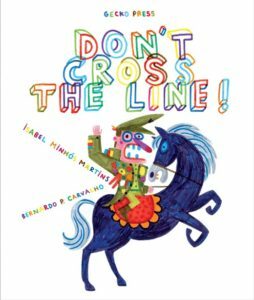 The best picture books are like a marriage: the text and illustrations support each other but have a strong life of their own. 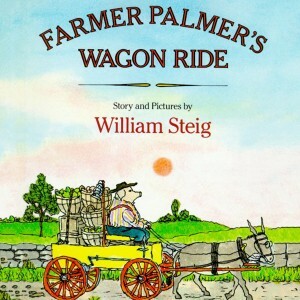 For very young children the plot should be focused and the pictures comforting. 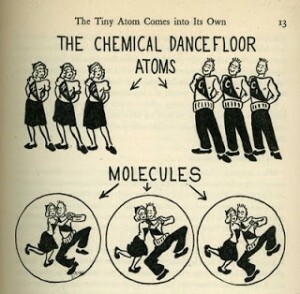 I Went Walking by Sue Williams is a perfect first book. The words are basic yet they incorporate repetition, questions, rhymes and humour. 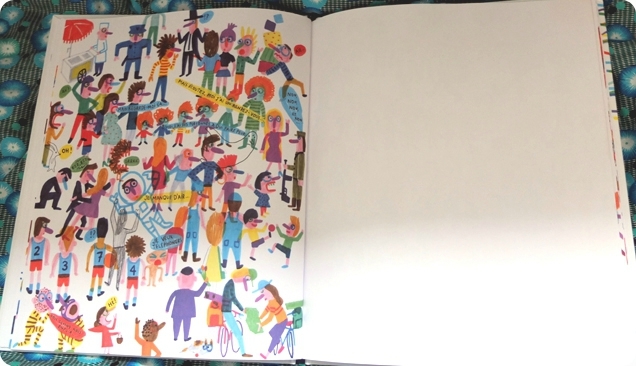 And the illustrations by Julie Vivas are sublime; leading the eye across the page in a dance of line, shape and colour. (See her gorgeous version of the Nativity too). 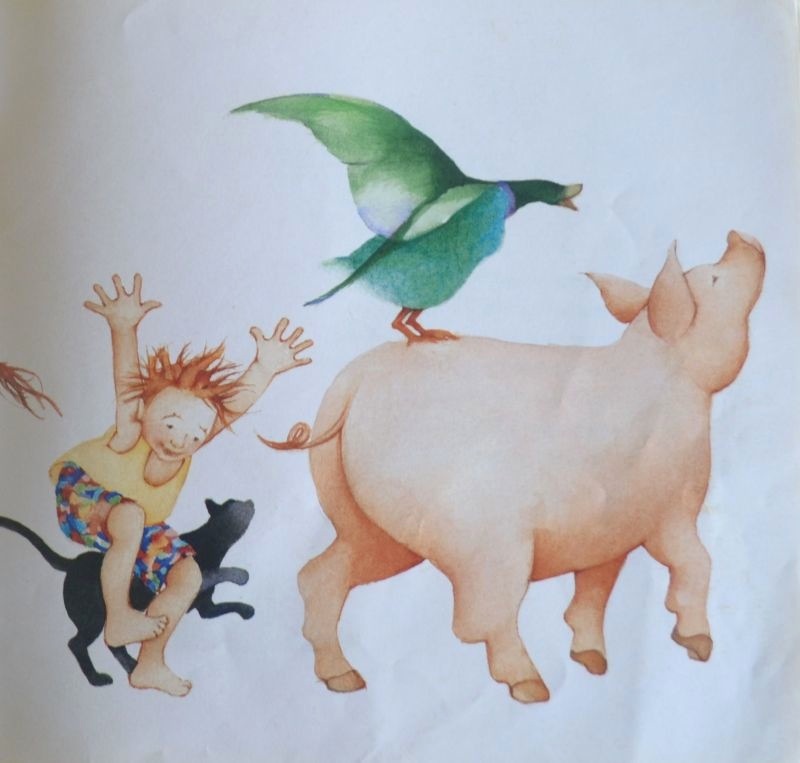 Max’s Bath by Barbro Lindgren is another delightful book for preschoolers. Max dumps his toys and his food in the tub and then tries to wash the dog with predictable results. Max is a classic ‘terrible two year old’ combining charm and mischief. 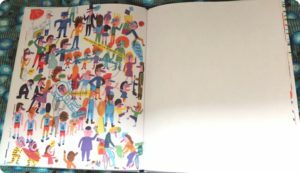 The picture book Seasons by French artist, Blexbolex is a unique, meditative book for young children that adults will relish for it’s design. It’s a tactile treat, printed in chunky hardback on rough paper, like old comic annuals. Each page has a single word and a subtle image to illustrate it. No garish colours here, just the quiet passing of seasons. 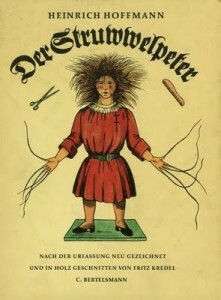 Struwwelpeter (Pretty Stories and Funny Pictures) by Dr Heinrich Hoffman (1845) is a classic of gleefully gruesome cautionary rhymes about naughty children. Hoffman was a psychiatrist who founded an influential Frankfurt asylum and pioneered counselling as an alternative treatment to cold baths. 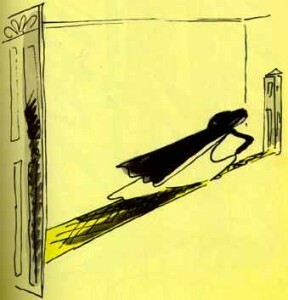 The characters in Struwwelpeter were inspired by his child patients – he’d tell them stories and draw pictures to calm them down. Hoffman was looking for a book for his three year old son and could only find ‘stupid collections of pictures, and moralising stories’, so he created Struwwelpeter. It was one of the first picture books designed purely to please children – before 1850 children’s books were mainly religious and moral lessons with titles such as An Exact Account of the Conversion, Holy Lives and Joyful Deaths of Several Young Children. 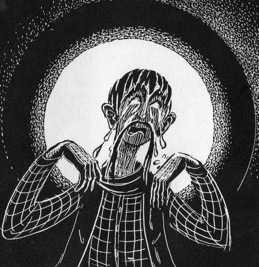 Read more about ‘Shock-Headed’ Peter here. 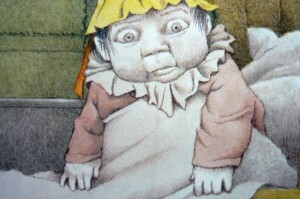 This is Wanda G’ag (it rhymes with blog) one of the finest children’s book illustrators. Her masterpiece is Millions of Cats (1928) the story of a lonely old couple who attract ‘millions and billions and trillions of cats‘. The pictures roll like waves across the pages; clouds, trees, hills and cats all swept along in the flow of the story. The black and white gives it that slightly unsettling folktale vibe. As a child I loved the army of cats drinking a pond in seconds, and the final catastrophic catscrap. Try to find her bizarre Nothing At All too, about an invisible dog. It was 1963, and I was terrified on my first day at school (primary!). I sat on the hard grey mat and the teacher read Horton Hatches the Egg to the class. I became so engrossed I didn’t even notice my mother slip out. That loyal elephant helped me get through that watershed day without too many waterworks. 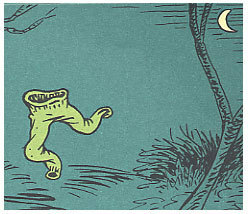 My other favourite Seuss characters were the Pale Green Pants and the Zizzer Zazzer Zuzz. Seuss pushed the English language to the limit. Ever wonder why Green Eggs and Ham is so repetitive? Seuss only had a 50 word vocabulary list to work with, but he created a classic. By the way writers, his first book was rejected 27 times. The word ‘Stinker’ was censored from the book in the 1940s as it was considered inappropriate for children. Burton was one of the great illustrators and the idea for Calico from seeing her sons engrossed with comic books. The wonderful design, cartoon framing and action scenes of Calico are worthy of a modern graphic comic: the flash flood and stagecoach crash are gripping highlights. But it’s that haunting image of Stewy that will stay with me. When I finally got home, my mom and dad hugged and kissed me and we all cried. We were a very emotional family. Read an essay about Steig and his books. The Nativity, illustrated by Julie Vivas, is my favourite Christmas book. 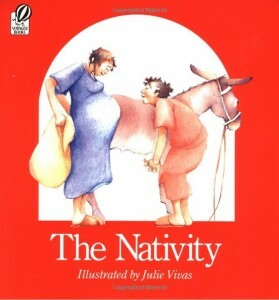 The pictures bring warmth and humanity to the story by showing the love between Mary and Joseph, the pregnancy and the rustic setting. Oddly, it sits well with the poetic language of the 17th century King James bible version. Vivas also illustrated the wonderful book for babies, I Went Walking. “Given the state of our environment, the sooner we introduce our children to bees – to their intelligence, their intricate behaviour and increasing vulnerability – the better. 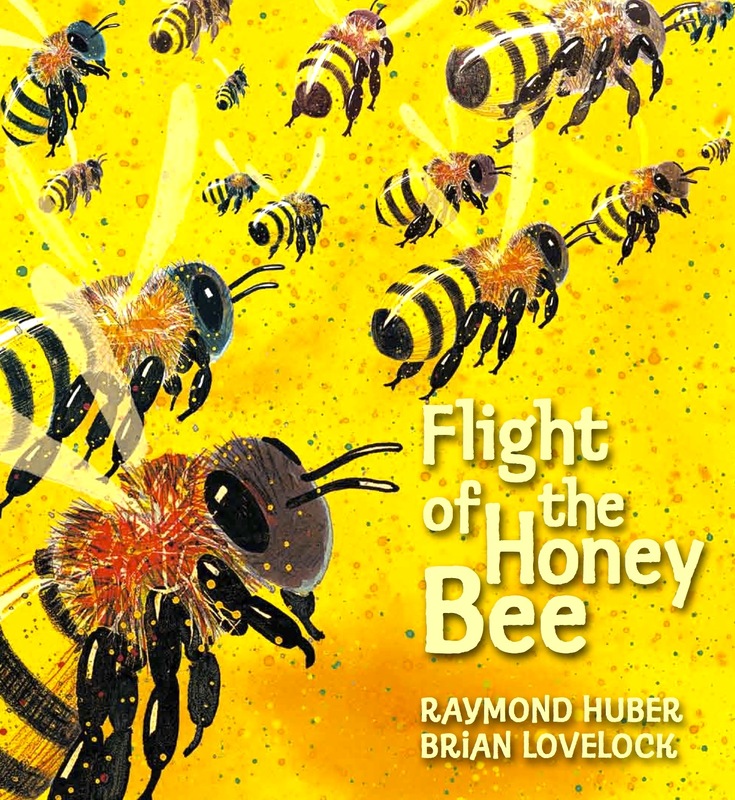 Flight of the Honey Bee is the perfect book to do this, combining as it does Raymond Huber’s careful language and well-researched text with Brian Lovelock’s meticulously observed paintings. Cleverly formatted, fiction and non-fiction – story and fact – are woven together as two discreet yet interconnected strands: young readers can choose their flight path. Exquisite to look at and a pleasure to explore. Scout the bee – named after the feisty protagonist in Harper Lee’s To Kill A Mockingbird – and her tightly-knit community of hardworking bees demonstrate these small creatures’ importance in the pollinaton of plants and the well-being of our planet. Flight of the Honey Bee is about bee behavior but it will also teach children about subtler things; wonder, beauty, the value of group functioning and collaborative effort, reproduction, risk, courage, the joys of flight – those rhythms and principles essential for any thriving community. The hum of the parts. This book has all the essentials of a satisfying story: it asks questions and it informs. It invites observation and participation. There’s drama. Suspense. Conflict. Danger. Hope. And a happy ending. At the close of her adventure, Scout is a wily-er bee than she was when she set out from her hive on her first nectar-seeking adventure. As all characters must, she grows through her experiences. We come to care about her and her safe passage home. Visually, Flight of the Honey Bee is exquisite to look at and a pleasure to explore – each double page spread is as stunning as the one preceding it. It will be immediately appealing to young readers. I was struck by how beautifully integrated the text and images are; they belong together like honey and honeycomb. The language is tender and witty (the line about ‘sun-powder’ is a wonderful change from ‘gun-powder’); and the paintings – a combination of watercolour, acrylic ink and coloured pencils – are spectacular; compositionally bold, delicate, exuberant and information-rich. Looking at them through my adult eyes, I can’t help thinking about fractals, the mathematics inherent in nature, the ever-present background dialogue between shape and sound, pattern and colour. Children will pore over them. And they will love Scout for her feisty resourcefulness. More Flight of the Honey Bee reviews. I find this book fascinating for its masterly use of colour and design, its grim humour, its coherence of idea, text and image, and for its acceptance of the dreamworld reality. The Were-Nana by Melinda Szymanik is a creepy delight about a visiting relative who might just be a monster. The suspense is nicely built up and the double surprise ending (true to horror traditions) is brilliant. Odd cover choice but fine shadowy illustrations by Sarah Nelisiwe Anderson. Te Kapo the Taniwha by Queen Rikihana-Hyland is out of print but was always popular in class. 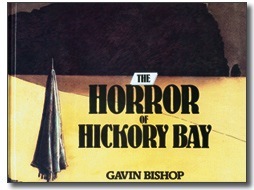 It’s the story of a half-man, half-monster who was given the job of shaping the South Island. Zac Waipara’s pictures are stunning as usual. After reading Wolfram’s dramatic story I discovered his daughter’s wonderful art. Alexandra Milton is an animal artist and children’s book illustrator. She creates her creatures by collage, using hand-made papers with mysterious names: Korean mingeishi, Thai silk thread, Himalayan khadi, and Payhembury marbled paper. 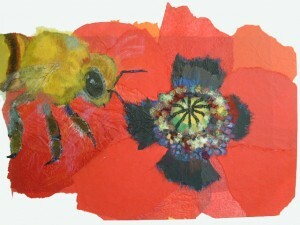 Her honey bee illustration below is warm and characterful (like bees). 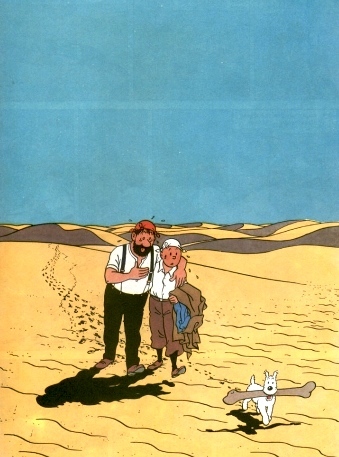 It sounds best in the original ‘klipp und klapp!’ of the German. 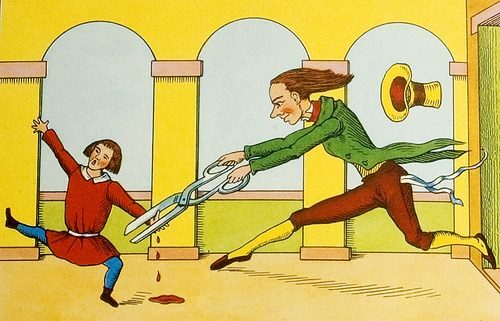 Less well known is the Nazi parody version Struwwelhitler (1941). Read the full story here.